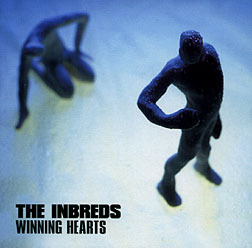 CD Review: The Inbreds, "Winning Hearts"
Is it possible that under that Malhavoc T-shirt, dog collar, general gonna-mess-you-up-mutherfucker facade of yours you have a soft spot for morose songs about relationships run amok? Are you nodding? Then the Inbreds have your number. "Can you hear me talking to your phone machine? Do you just sit back and have a laugh at me? I've been running round, running round for weeks. I've been running round, running in my sleep. I get the runaround, running round for weeks..."
If this sound like something you might know a little something about, reach for the Inbreds. This 13-track tour of early-adulthood woes is a catchy piece of work (especially "Attitude," "Yelverton Hill" and "Sometimes"). Still, it's not as good as Kombinator, the band's second album (this one is number four). It lacks something -- or maybe it's not so much that it's lacking something as much as it's repeating something they've already done. To listen to their lyrics is to dig the Inbreds. If you're not the sort to do so -- and most aren't, it just depends on what you want out of the music you listen to, I suppose -- then maybe you'd find them a bit pedestrian. And, admittedly, there's not much variation in their one-two, one-two rhythm, but it certainly works well for them. Some folks find this Kingston duo boring. There's a cool fuzzy sound to the Inbreds, the aural equivalent of a grey wool sweater. They don't use much in the way of guitars -- just a bass most of the time. No fancy samples, no shrieking (although they do raise their voices once in a while), no nuthin'. But boring? No.